Bishops Benson : Wilkinson : Gott above predella scenes of sowing and reaping. Mary and Emma Barrett, daughters of William and Charity Barrett. William Barrett of Chenoweth Farm, Landulph, died 15th January 1892 , his wife Charity Collings Barrett, died 16th October 1884 , their son William Henry Barrett and daughter Elizabeth Ann Adams. Death of Charity Collings Barrett Cornishman October 23, 1884 p 8, Royal Cornwall Gazette October 24, 1884 p 5. Death of William Barrett, Royal Cornwall Gazette January 21, 1892 p 5. Predella scenes same design as St Stephen-by-Saltash North aisle 2 and South Hill North transept north, which also includes Bishop Benson. TDF 8/9/13. TDC 1914 : 255. Bishops Benson, Wilkinson and Gott, the first three Bishops of Truro. Photograph copyright © www.asnapintime.co.uk, used with permission of Ryan Smith. Edward White Benson, D.D. First Bishop of the restored Cornish See 1877 to 1883 . Afterward 94th Archbishop of Canterbury. Archbishop Benson holding, in his left hand, a model of Truro Cathedral and, in his right hand, a pastoral staff. Photograph copyright © www.asnapintime.co.uk, used with permission of Ryan Smith. Detail of Archishop Benson. Photograph copyright © www.asnapintime.co.uk, used with permission of Ryan Smith. George Howard Wilkinson, D.D. Second Bishop of Truro 1883 to 1891 . Afterward Bishop of St Andrews and Primus of Scotland. Bishop Wilkinson, holding in his left hand a crozier and with his right hand raised in blessing. Photograph copyright © www.asnapintime.co.uk, used with permission of Ryan Smith. Detail of Bishop Wilkinson. Photograph copyright © www.asnapintime.co.uk, used with permission of Ryan Smith. John Gott, D.D. Third Bishop of Truro 1891 to 1906 , who dedicated this Church after restoration, 1902 . Bishop Gott holds in his left hand a crozier and, in his right, a book. Photograph copyright © www.asnapintime.co.uk, used with permission of Ryan Smith. Detail of Bishop Gott. Photograph copyright © www.asnapintime.co.uk, used with permission of Ryan Smith. 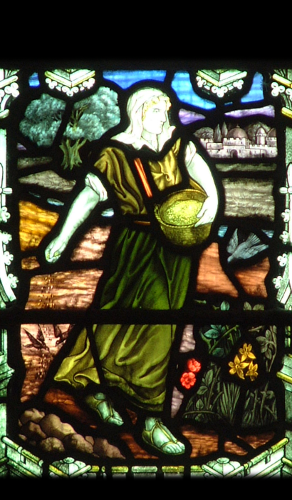 Left-hand predella: the parable of the sower. Photograph copyright © www.asnapintime.co.uk, used with permission of Ryan Smith. 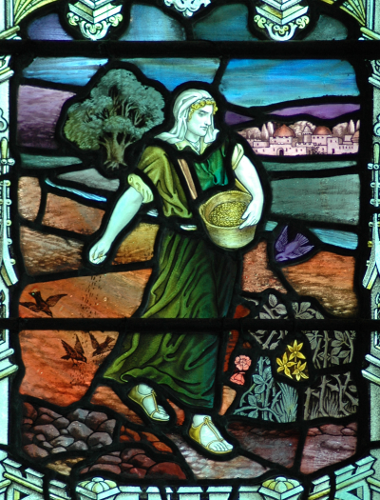 Centre predella: the harvest at Bethshemeth ( Ⅰ Samuel 6:13). Photograph copyright © www.asnapintime.co.uk, used with permission of Ryan Smith. Right-hand predella: Ruth. Photograph copyright © www.asnapintime.co.uk, used with permission of Ryan Smith.